I'm a gin lush, it's true. As Divine Comedy put it, "I'm the gin in the gin soaked boy"(but I'm not Jeff Goldblum in the fly!). You can put just about any alcohol in front of me and I can easily pass it up. With one tiny exception. Put a glass of gin out there and I'll be on my knees lappin' it up before you can sing oh susannah (and she was a gin junky by all accounts, as well). Gin, aside from being the world's best alcoholic beverage, has inspired many a song. From Snoop Dog to the Reverend Horton Heat, from Muddy Waters to The Ramones, it seems everyone has weighed in on the good --and sometimes bad-- of gin over the years. Gin has long fueled musicians in more ways than one. Sadly, the reason for this post --and there is one as you will now see- is that the Washington State Liquor Control Board, in its (in)finite wisdom, has discontinued the world's best brand of the world's best alcoholic beverage. Booth's London Dry Gin, with it's near 300 year history, and a royal pedigree to boot, has been tossed aside to make room for some dorm-room distilled brand that would rot a Dutch pirate's liver from the inside out. Tonight marks the end of an era for Mr. Suave. Even as I write this I'm sipping the last gin martini made with Booth's that I'm likely to get in this lifetime (in this state). I've been drinking Booth's for about 18 years now. I've had family members bootleg it across states lines from Oregon where it sold for less than half the outrageous overtaxed price it sold for here in our puritanical state of Washington. I've considered buying in bulk, especially when the discontinued labels went up at the local WSLCB Store #53. 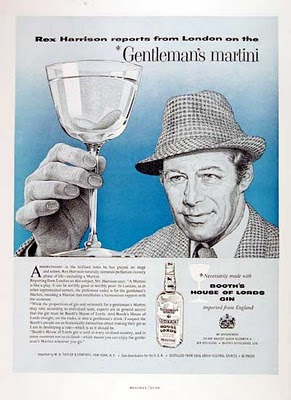 Booth's was first and foremost a gentleman's gin, as evidenced by their 1950s ad campaigns with Rex Harrison and Basil Rathbone. But, it was a gentleman's gin long before that, thanks to being founded by a member of the House of Lords in 1740, and later championed by his heir, Felix Booth the Sheriff of London. The original label sported a royal crest with the words "by appointment to Her Majesty the Queen." Even as his distilleries pumped out gin barrel after barrel helping amass a lordly fortune, Felix Booth financed an exploration to chart the Northern passage. It failed. But it did result in northernmost part of mainland North America, near the Arctic in the Kitikmeot Region, located in the Canadian territory of Nunavut, being named the Boothia Peninsula. 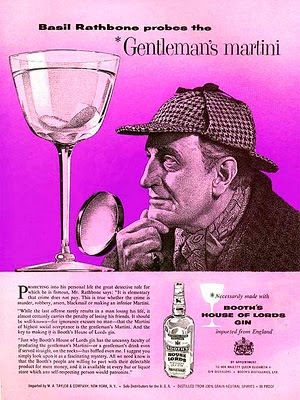 The Booth's Gin that is distilled today (by the same company that now owns Gordon's and Tanqueray) uses the same recipe as that used in the 1740s and the pot still is a replica of the one used by good Sheriff Felix. Soft juniper nose; medium body, wonderfuly perfumed palat with juniper right up front of floral/coriander backdrop; crisp, dry finish. Recommended. Among gins of note only Beefeater and Tanqueray receive a higher rating from Regan. My own review of Booth's would be that it is a juniper proper gin. I think its first bite brings the juniper right out front, which any good gin should. Gin is not a drink of soft edges, but rather one that should pronounce itself loudly in your mouth, without being cutting like bourbon or rum. Where vodka is a blank slate all too eager to be fortified by whatever you douse it with, gin stands tall with it's own distinct flavor. That flavor is in the botanicals -- the wildly varying concoction of herbs, spices and whatever else fits, that the distiller thinks will work. Even then, the same recipe can be distilled once, twice, thrice, or even more times, creating a different flavor with each pass through the pot. Booth's gin gives you a nice big juniper pinch at first taste. Following that there is some sense of orange peel, licorice, coriander, and cinnamon that linger on your tongue. It's a traditional gin flavor that favors a full bodied, slightly sweety, juniper taste over everything else. It is, allegedly, from 1740 after all when it's unlikely that they were experimenting with ginger, limes or sundried tomatos. There have been some quite good gin songs over the years as I mentioned above. But for me there are a few songs that just go well with a bottle of Booth's (and I do mean bottle, friends). So here's my short list of great gin songs. Gin, unlike most other alcohols, require's little additional adornment to be enjoyed, so I've selected primarily instrumentals. Not necessarily songs about gin, but songs that just go well with gin because the invokes a sort of gin reaction in your tastebuds, or at least in my tastebuds.